Do you want to attract various bird species in your compound? Invest in the Bird House Flower Watering Can. 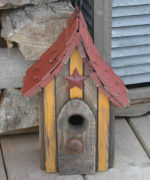 Just as the name suggests, this item is a watering can made in the design of a wooden bird house. It can house a typical bird family, thanks to its ample space and visually impressive design. Most of the parts are wooden, with a few metallic parts such as the collar and joining nails. To make it functional, the bird house design comes with a back door. This way, you can empty litter, droppings and clean the birds’ habitat when they are not using it. It measures 8.5 inches in weight, 8 inches in width and 4.5 inches in length. The exterior is tastefully painted- green and red rose flower-themed side and a brown roof that looks like your tiled roof. It can sit on a flat surface or be suspended overhead. It makes a nice gift for bird lovers!